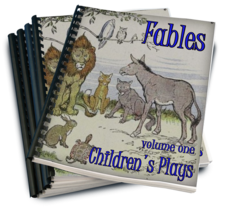 Fables – Children’s Plays Volume 1 – 6 fun fables from your favorites: Grimms, Aesops, Hans Anderson, old legends and stories past through the ages. All transformed into action plays for your young thespians. As with all fables, there’s usually a moral lesson to learn. Still true! Each play holds a moral lesson, as usual. It’s always a good day for a play. And, yes, performing in a play is fun. Watching a play is fun. But, did you know that plays are actually beneficial for teaching language skills, developing confidence and social skills, critical thinking skills, along with reading comprehension and development. Communication skills (verbal and non-verbal) are enhanced through drama. We are all familiar with team work and its valuable life lessons. Acting in a play requires team work. Another highly documented benefit to a child’s social growth is participating in role play. That’s what acting in a play is! - Role play. Even kids who complain about not wanting to read are interested in the dramatizations. Let’s face it, not all children like to sit with a book in their hand. Some are hands-on learners. Yes, another benefit to a play. Introducing children to this format when they are young is a great means of instilling these valuable life lessons. Familiarity is a good thing when it comes to getting children’s cooperation. Is it not? Sometimes they’re not so eager to try new things, but once they dive in, they might just be hooked! The Golden Goose A cast of 5 will have fun with this nice length 4 act play. Positive rewards come to those who deserve them. The Song in the Heart A nice length. This cast of 7 has 2 acts which highlights the positive behavior traits of honesty and truthfulness. It also highlights quite nicely the rewards of following your heart’s dreams. The Emperor’s Test Here we have a 3 act play with a large cast of 12. Watch and learn how important the powers of observation are. We learn, also, a bit about entitlements. Anyone who has suffered through an employment interview will appreciate this funny play. That will be lost on most of the participants, but the audience will certainly identify. The Red Shoes A great size cast of 12 with 4 acts, we learn there is a cost of deception and dishonesty. You will see how the sin of pride takes its toll. But, there is always the possibility of redemption. Quite satisfactory in the end. The Wild Swans Wow! What a cast – 25 and 4 acts too. This is a great play. Full of possibilities. Love can conquer mountains. The power of love and perseverance makes this play’s message very rewarding. Courage is a virtue, you don’t have to be big and strong to own. This play highlights that perfectly. The Ugly Duckling Another great play in size and length. This cast of 25 has 3 acts for plenty of acting fun. Here we learn about acceptance, friendship, bigotry, fair treatment and prejudice. It has it all. Positive lessons, to be sure. Your plays will come to you in pdf format. Easily downloaded and ready to print individually. You will receive all 6 playscripts right away. Use as you wish. Now or later. Today, tomorrow, next week, next year. They're yours. Just download your pdf when you get your link. That's it. Then print and use as you need them. Print as many copies as you need for each production. This is a great tool for learning script lines. Your e-books come with an . . .
Fables – Children’s Plays Volume 1 E Book is totally risk free to try. Nothing to lose. If it isn’t everything I said it is, then return it for a full refund. You get instant access to your copy of Fables – Children’s Plays volume 1 in under 10 minutes through a safe and secure transaction. Right after your order is approved (usually in seconds), you will be able to download immediately. It's that easy. And, with PayPal you know it’s secure. You will need Adobe Acrobat Reader to view your PDF file. If you don't have this installed on your computer, then you can download it for free. The power of creative play is awe-inspiring. What parent doesn’t appreciate a child’s imagination in action? A creative and fun way to spend those lazy summer hours or a gloomy, rainy day indoors. Teachers? How much classroom fun might these plays provide? Fables – Children’s Plays volume 1 is not available in stores. Great for . . . Craft Projects – Props and costumes make great craft projects for stagnant hours. Don’t miss out on any of the fun. Get your copy today. Ahh, the power of creative play. There is nothing more awe-inspiring than a child’s imagination in action. A spectator sport every parent can appreciate. Watch as their imaginations bloom. And don’t forget they’re educational too!